It is not that frequent to see beastie Transformers in the 3 movies of Transformers. 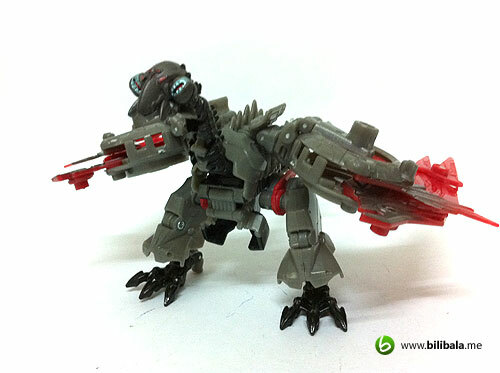 I guess you can already make a count of them which is Ravage which appears in Revenge of the Fallen and of course, the latest additional to the movie beastie family: the Laserbeak! 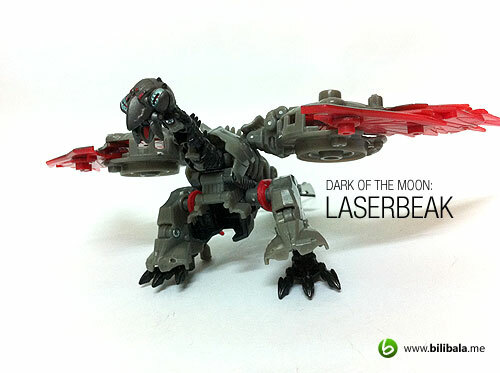 In case you are asking who is Laserbeak? Well, if you have watched the Dark of the Moon, this “lovely” bird appears a few times in several scenes bearing different alternate mode: from printer to PC and to LCD TV mounted to the wall, etc. Speaking about multiple alternate modes here and definitely much more versatile and flexible in juicing up different transformation sequence. However, and of course, you wont have a triple changing or quadruple changing mode for the toy definitely! Read on! If you are a G1 fan, you will sure know that Laserbeak is one of the cassettes (along with Ravage) which make them the tiny minions of Soundwave. 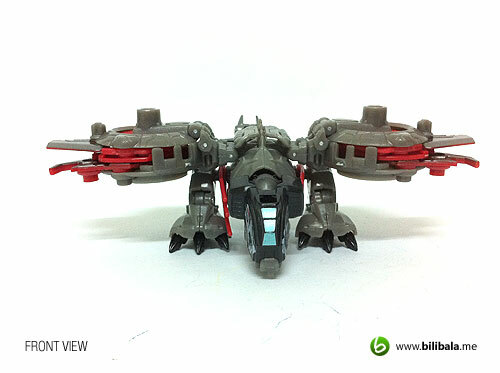 Anyhow, don’t expect that this new Laserbeak will turn into a small cassette that fits in Soundwave play deck. 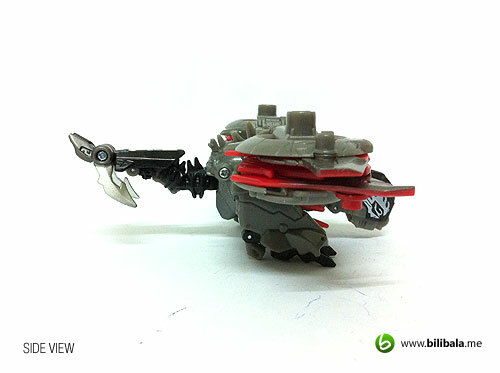 This time around, he has a new alternate mode and definitely new mechtech expandable weaponry at your disposal! 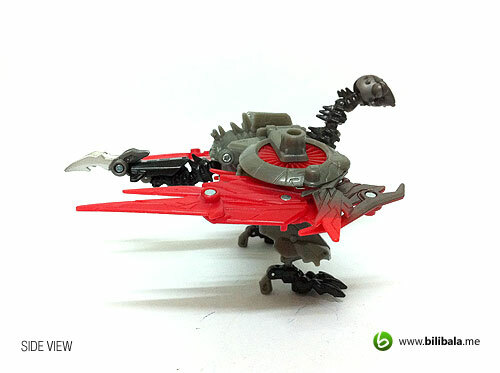 The alternate mode of Laserbeak is not your everyday spy craft. I couldn’t find any resemblance of modern aircraft to match his alternate mode. The closet bet will be a modified modern VTOL (Vertical Take off/Landing) air craft. If you want a even closer resemblance, it would be of the fictional GI Joe Sigma 6 Dragonhawk plane. 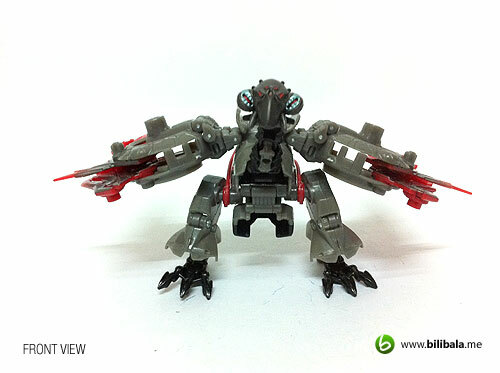 Anyhow, the alternate mode still have some clear resemblance of the beast form of Laserbeak especially the 2 landing gear which obviously are the craws and legs for the robot mode and the rear rotor which also gives away of its tail. Pretty abrupt alternate mode i must say. 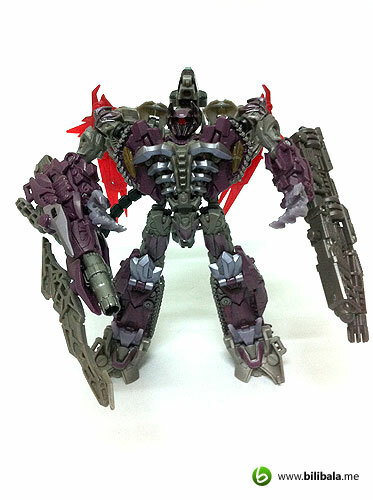 Anyhow, it has much more better transformation compared to the alternate mode of Ravage which the latter is just like a forceful transformation to cybertronian alternate form. Which is quite a relief. I like the decal being done to the “helmet” or the head portion of the plan. It looks “sharky” like some of the decals on some modern war planes/bombers. From the front, you can see more clearly the craw-ed landing gear. The overall color composition is of Greyish and some fiery red color for those “organic” parts namely, the beast wings that concealed nicely in the propeller compartment of the craft. See the rear section of the craft which somehow gives away of its beast form and doesn’t look natural as a part of a normal craft/plane. 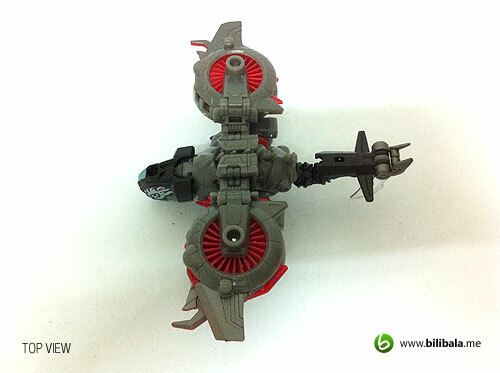 You can see the 2 propeller compartment is actually storing the wings for the robot mode. 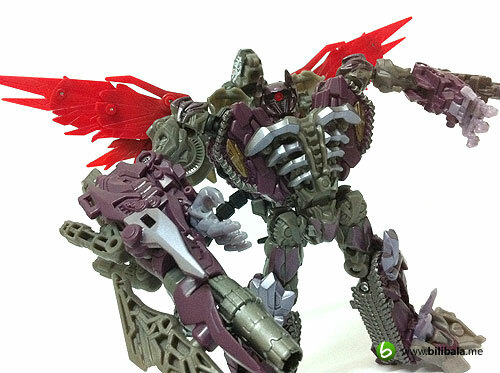 Nicely done design, i must say and these wings can be extended widely in robot mode. You will get to see them in a short while. I like how the details for both the propellers being done. They are actually spin-able and not fixed. Quite neat. 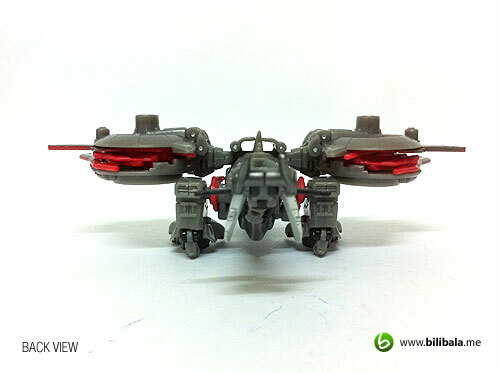 With just a few flicks, you will get Laserbeak in robot action in no time. My personal 1st impression of him: what a Metalic ugly big turkey with red wings. 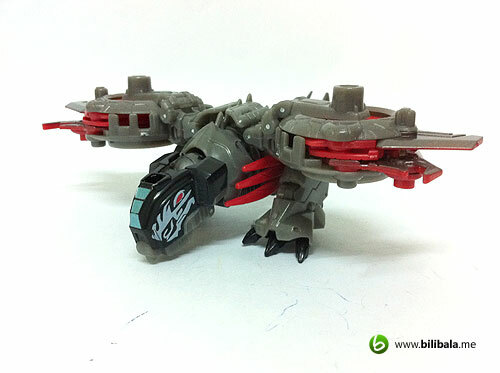 Personally, the robot mode does looks not proportionately done with bigger body and small head and tail. Well then again, is purely my personal feeling towards him. 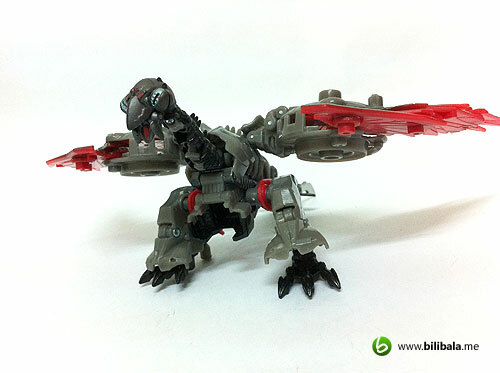 Okay, being a beastie Transformers, there is definitely no arms for him and it is being replaced by the 2 fiery wings. And articulation wise you have some limitation as well as not much can be moved like a normal limbs which a normal robot toys do. However, to compensate that, they have made joints to the neck and tail for it. 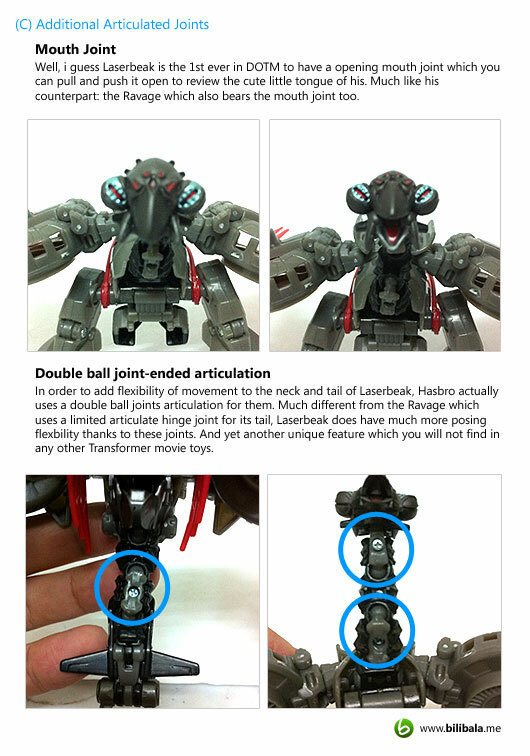 More details in gimmick section for this additional joints. From the side view, you can notice how “skinny” the neck of the Laserbeak and it does give me a “skeleton” look and feel towards it. 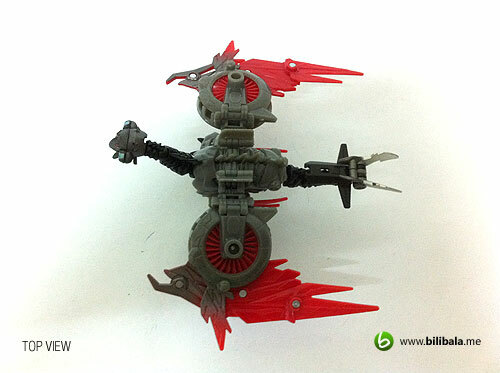 See how the wings are like in robot mode out of their storage. These wings can be very much expand to sideways and it can range up to 25cm in width. Kinda cool on how the joints works for the wings. And the fiery red does make the whole figure stands out despite the ugly little turkey head. 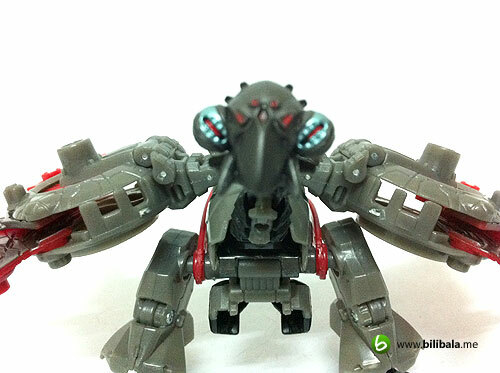 Much details have been done to the head of Laserbeak. You will get to see the only blue colored part here and the tiny eyes of the hideous beast. Well, you wont call him a Decepticon with no reason, they do have wicked and hideous face. (C) Transforms and Roll Out! Transformation is easy and most of the process is just taking the wings out of the compartment and flipping of legs and helmet. Kinda straightforward and definitely it will take lesser time for 1st transformation. Again, i really like how the wings are being concealed nicely in the propeller compartment and this is truly a genius design. 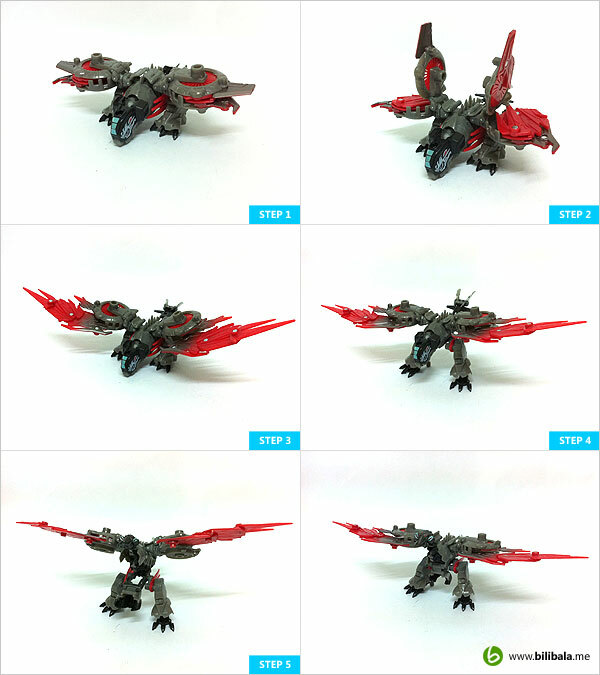 In additional, i like the mode in Step 4, it does make it like a Ger-walk mode with the 2 fiery red wings spanned widely. (D) Show Me Watcha Got! 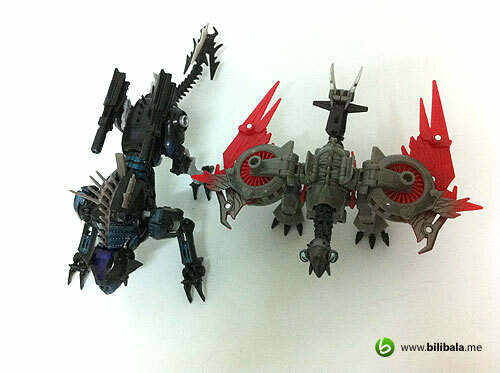 Apparently, the size of the Laserbeak is in proportion with its counterparts: The Ravage. Here’s a size comparison in alternate mode. Both almost having the same width and length. 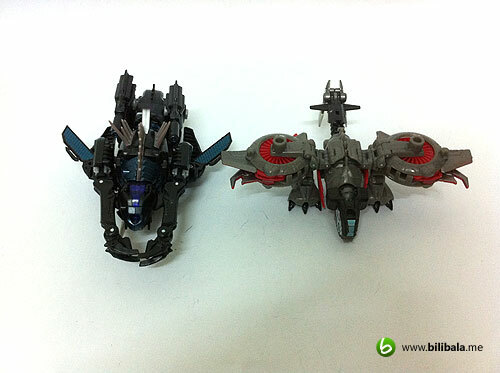 While in robot mode, size are quite similar as well. 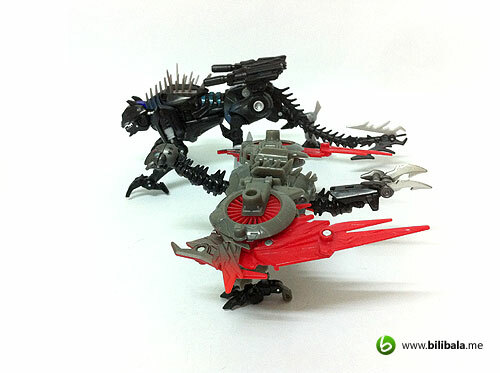 Great, they make a wonderful pair of attacking beast Transformers! Well, is time for some eye candies. Feast on them, boys and girls! (G) Special Combination/Appearance: The Winged Shockwave! 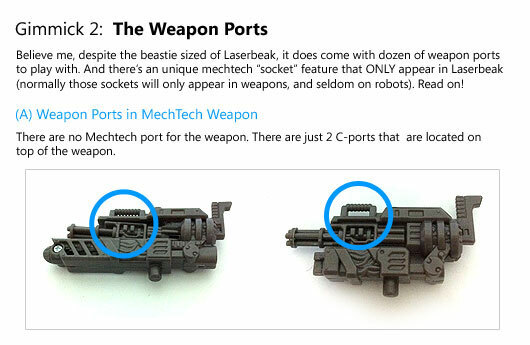 Well, as mentioned in the gimmick section for the extra pair of Mechtech Sockets in Laserbeak and guess what? 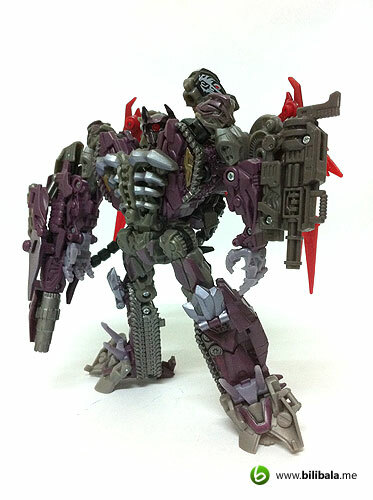 It can be combined nicely with Shockwave to form a much more powerful and formidable Shockwave! Combination is straightforward nevertheless, but the output for it is one word: AWESOME! Now, Shockwave has red wing and can fly like Jetwing Optimus Prime. Bring it to the sky, Optimus Prime! 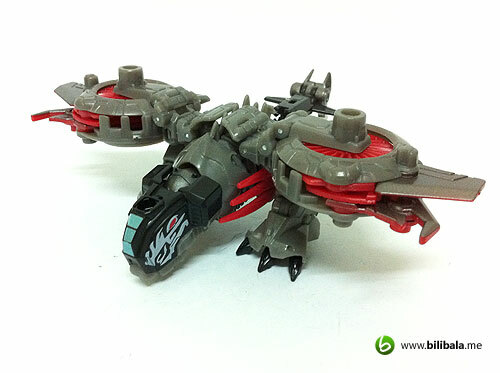 With the expandable wings of the Laserbeak, it can form a contracted wings behind which give him a resting position. Much like a batman – shockwave now. 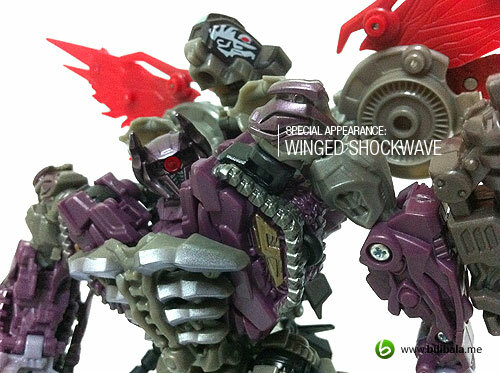 The red color from the wings does bring out the vigilance of Shockwave. I really like this combination. This is how the rear looks like. Very nice combination indeed! With the Mechtech Port on the helmet of Laserbeak, you can attach one of the cannons to it and form a head cannon for Shockwave. Now, that is what we call MechTech in play! 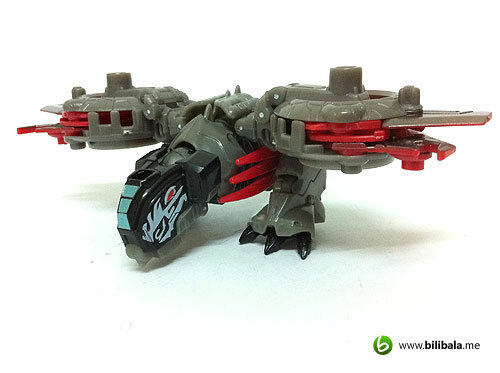 Well, i am not particularly a fan of beastie Transformers but i somehow attached to this Laserbeak. Apart from its nice wings it has and mainly due to ability of it to combine with Shockwave which make collecting him much more worthwhile. Moreover, with the numbers of 5mm Mechtech ports it has, it is so far the most Mechtech ports deluxe class around. Putting aside the QC problem on the design for the Mechtech weapon, it is definitely a collection you shouldnt be missing, ESPECIALLY if you have Shockwave in the first place. You should try out the combination as well. 🙂 My Personal Collection Rating for him is 9/10: small, ugly but featured packed! Definitely not your ordinary Dark of the Moon collection! Well, you've gotta point there. But, don't care lah, as far as they look cool that's all right. 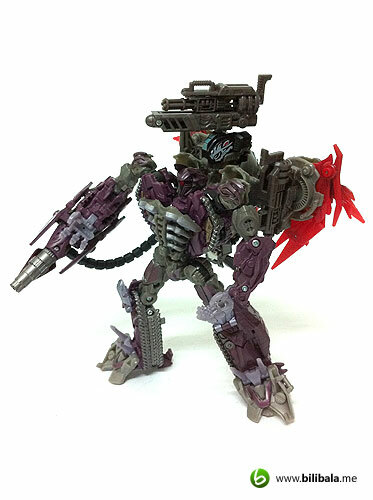 It is going to be the same if we put decepticon mech-tech weapon on autobot or vice versa. 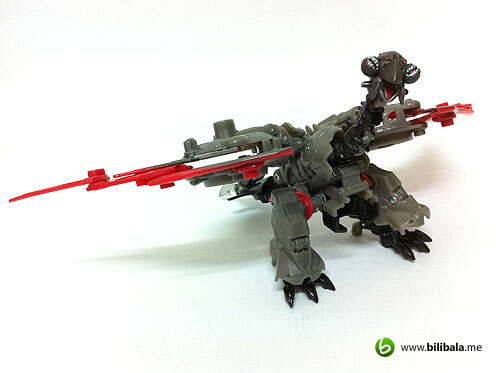 As for mech-tech weapons, they really improve a figure appealing level if not overdone. Optimussmyth in youtube has showcased some possibilities. 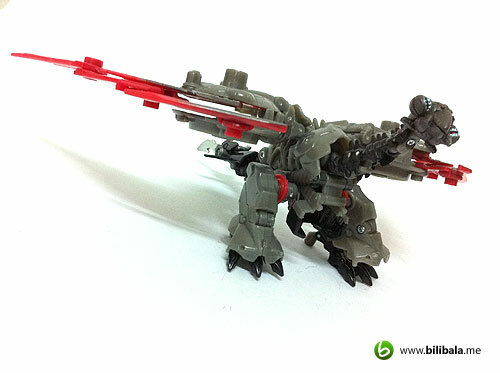 Try this keyword in youtube, -- The Endless Possibilities with Transformers "Mech Tech" --. Hope you like it. It is your idea that sparks this combination, haha. 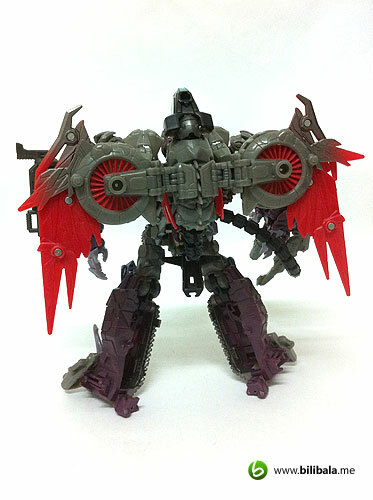 In between, just fyi, I think we can use the same laserbeak-shockwave technique on ultimate optimus prime (just prime, without the trailer). 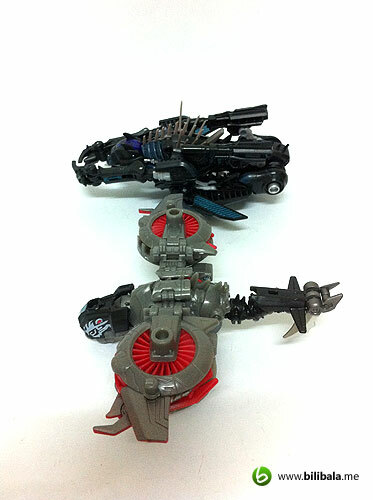 Laserbeak can be pegged on both oil tanks at his back. Cheers. Hey Francis, thanks for your creativity for the combination. 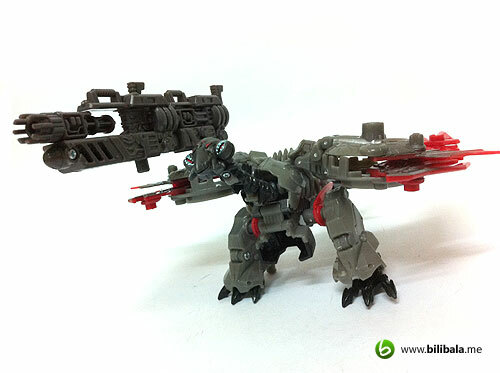 I attempted on Megatron instead, check it out at omoryang.blogspot.com. Cheers. the "turkey" is fearsome! LOL! 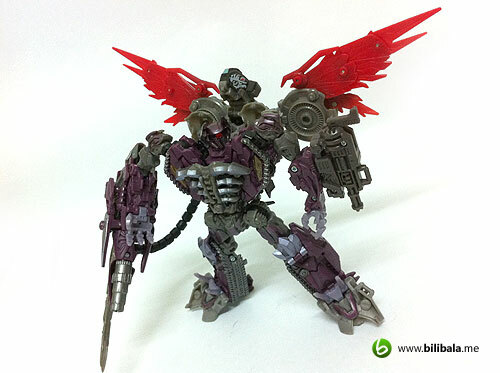 the wings look a tad too small for shockwave for me but it does look really cool. Hey, you forgot Scorponok - he was also a creature feature. My poor Scorpie, being forgotten ~ sad :( But the combination is a surprise! Nice, makes Shockwave looks more menacing. This will definitely push up the value for Shockwave and Laserbeak. Better grab both before they're gone! Ewww. He looks like a cute parrot! Not fearsome at all! Fail!